The Canadian keeps chugging along, not being perfect, but smart and aggressive. She loves to go out and bang the ball, and, even though she is only 20, she doesn’t seem to get nervous at the Slams. That is highly unusual amongst the kids. Begu has looked pretty darn good, shocking Angie Kerber in the first round, but she has yet to go deep at the Slams. Bouchard wants to go against Maria Sharapova in the quarters, which is why she will crush Begu in two sets. Sharapova and Peng have known each other for a long time. The Chinese has settled down mentally over the past two years and now has a different look with her volleys. She can hit hard on both sides, but Sharapova is more powerful and can mix it up more. Peng might be able to find the zone and shock Maria somewhere, but its not going to be at the AO. Sharapova will win in straight sets. 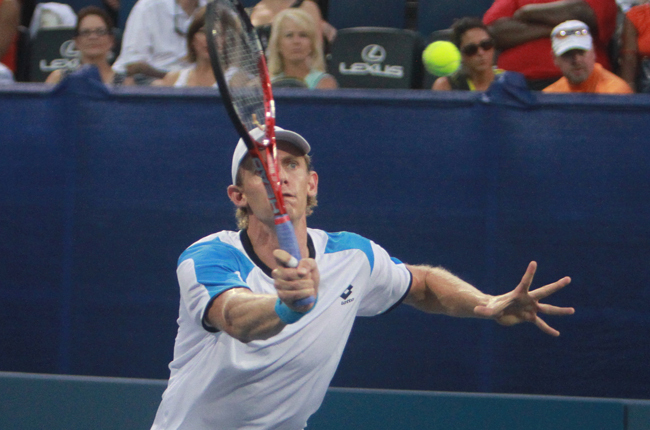 Kevin Anderson has a tough task today. Nadal almost went out in the second round due to a sour stomach and Tim Smyczek playing in the zone. But two days later, he looked much better and he crushed Dudi Sela. This time, he is going up against the huge serveing Anderson, a very tall guy who isn’t slow and has improved his speed gradually. He has a big forehand, his backhand is pretty consistent and not bad with the volley. But how can he unearth Nadal now, given that the Spaniard is ready to begin playing extremely well again? Rafa isn’t quiet there yet, ashe missed much if the second half of last year to injuries. Now, he has turned the corner. As long as he can push his balls deep, then he will yank Anderson around. If he doesn’t, the South African can push forward and hurt him. Anderson will take a set, but in the end, Nadal will grab in four sets. Halep is in fine form. She will be super steady and attack the ball when she can. Her backhand is wicked and her forehand is deadly. It’s hard to understand why she keeps changing coaches, but at least during the past few weeks she has looked very good. The Belgian Wickmayer once was a potential top-5, but she never got there. She can crush the ball and move fast, but she has been so erratic. Her game worked fine in the first three matches, but Halep is way too good right now and will win easily in two sets. These two have played very close over the past two years, with Dimitrov winning Acapulco and Wimbledon, and Murray winning Brisbane, Miami and Paris. While Murray is obviously more solid, Dimitrov has as much more variety than the Brit does. The Bulgarian has a beautiful one-handed backhand and mixes it up, but he can be impatient and that can hurt him. Dimitrov thinks he can take out the best of them, but he can lose control. Murray has had an easy draw in the first three rounds, but he has played very well. He struggled in 2014, but now he looks like he is ready to challenge the Slams again. Dimitrov will push him in five sets, but in the end, Murray will shine. Berdych has been here, many times, both good and bad. He has a terrific first serve, his forehand and his backhand, which is good but not spectacular. He isn’t very fast but more or less OK. It’s up to the Aussie Tomic to play great and take him out without getting upset or tired. But I really have felt over the past three weeks that Tomic has been very impressive overall. Yes, he wasn’t perfect, but he was getting there. He has a lot of variety and if he stays in there, mix it up and takes big swings than he can win. I could be wrong, but Tomic will play out of his mind and win in five sets. Makarova has really come to play. I thought that the young Pliskova was ready to rise and take down Makarova, but the Russian was a cool customer. She is tall, can smoke the ball, can defend and go into offensive and take over the nets. Her German foe, Goerges, has improved overall. Not only can she swing as hard as she can with her famous forehand, but she has played a lot of doubles, and as a result, she is much more consistent up at the net. Goerges believes she can win, but she has yet to prove that at a Slam. Right now, Makarova is more assured and will win in straight sets. The teenage Aussie is rolling through this tournament. His back has bothered him, but his massive first serve and gigantic forehand continue to carry him. He is enthusiastic and loves a big court. At this point, if he says healthy, Kyrgios will be in the top 20 by the end of the year – or better. Seppi played his best match stunning Roger Federer, but he is a veteran guy and he is not a fantastic player. Kyrgios will out hit him and win in four sets.